So you’ve finally got the site finished – launched and have been tracking its hits on Google analytics. After a few months you have what we call your organic hit pattern – that is the number of hits your site is going to get on average based on your existing customers, plus a few new ones from Google and other marketing activity. If you decide that more traffic is needed – then its time to look to marketing your site – either on its own or as a part of your overall business promotion. Whilst there is an almost endless list of online advertising options – traditional media may also be relevant. What about a blog, Facebook or Twitter? Time to look at your marketing plan – at Internet Agency we have an established and proven record of business marketing, not just online but also using radio, print and television. To grow your sites traffic, grow your brand and sell me – ask for a marketing consultation. 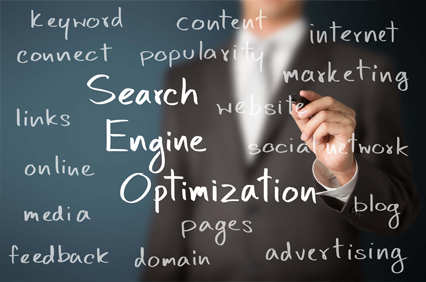 Simply put, Search Engine Optimization is the process of making your website more visible to search engines. And the more visible you are to search engines, the more visible you are to your potential customers. With specific techniques, Internet Agency can help drive SEO to increase your search rankings and increase your website traffic. Using social media (such as Facebook and Twitter) is about engaging with your customers. You can better access their feedback as well as generate leads and increase traffic to your website. To get the best out of social media use the expertise of Internet Agency to manage this for you. A business directory on Google is another platform from where you can promote your business. Not only does a business directory convey basic information such as your contact details and your location on a map, but on your page you can add photos, videos and advertise special deals that can be updated regularly in real-time. Create a Google business directory with Internet Agency to drive SEO and further increase your exposure. Google AdWords are the ads that appear alongside your search results when using Google. By using Google AdWords, your ads will be visible to people who are already searching for the kind of goods and services that you offer. Let us integrate AdWords into your web strategy today. Having a website live and operational is only one part of the plan, monitoring its performance is essential in getting the most out of your website. Google Analytics gives you critical information such as how people found your website and how they explored it. With this data, you can modify and improve your site to enhance a customer’s experience. Internet Agency offers expert Google Analytics installation services or comprehensive audits and configuration if you already have Google Analytics installed. Following the initial requirements capture and audit we will present all the identified issues and opportunities and will carryout advanced code implementation and reporting configuration to ensure you are gaining maximum business benefit from Google Analytics. Contact us today for more information regarding online marketing.